Our LTSIG Co-ordinator, Sophia Mavridi, talks about the work of the Learning Technologies Special Interest Group and answers questions about her own presentation on Digital Citizenship. This area of research is both fascinating and elusive. It’s fascinating with regard to the prospect of becoming more self-aware as teachers online, and elusive in the sense that we often fail to see how our professional and private personas can overlap and sometimes distort our carefully nurtured digital footprints. Listen to Sophia describe her talk which will be presented as a practical workshop on carving out a professional online presence and putting one’s best foot forward online. 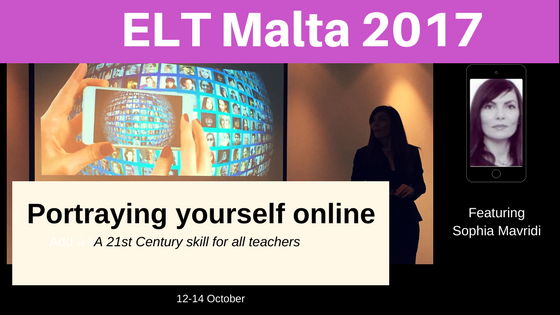 ELT Malta is certainly the place to be this October 2017. Sophia has been involved in ELT since 1998. Over this time, she has worked as a primary and secondary school teacher, Director of Studies, teacher trainer, writer, EAP tutor, and more recently EdTech lecturer on the TESOL MA at the University of Salford. Sophia is the IATEFL Learning Technologies SIG Co-ordinator, a special interest group specialising in the pedagogically sound application of technology to language teaching. Her research interests include the increasingly important role of digital citizenship and digital ethics in educational contexts and she is currently working on digital literacy projects around Europe.